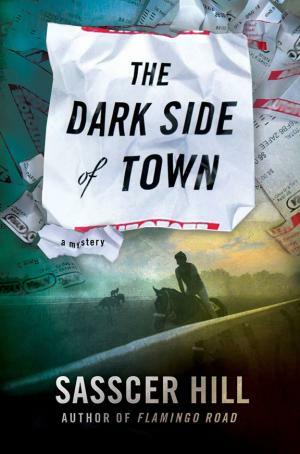 The Dark Side of Town(2018) is the second murder mystery by Sasscer Hill featuring Fia McKee, a former Baltimore police officer and now an undercover agent for the Thoroughbred Racing Protective Bureau (TRPB). Her first novel, Flamingo Road, is set at Gulfstream Park Racetrack in Florida, and this novel is set at Saratoga Racetrack in Saratoga Springs, NY. Undercover agent Fia McKee, now officially employed by the TRPB as Fay, is sent undercover to Saratoga Racetrack to investigate Mars Pizutti, a racehorse trainer whose horses’ wins are suspiciously lucky – and lucrative. Fia’s bosses believe Pizutti's success is based on illegal drugs and deceitful methods, and they want Fia to work inside his barn to ferret out the truth. After witnessing the tragic and inexplicable suicide of a jockey, “Fay” discovers the rider’s death is only the tip on an iceberg involving the mob, a crooked racing hedge fund, and threats to the lives of another jockey and his young sister. “Fay” must find out who’s connected to whom, and what shadowy forces are at play before someone else dies. This is a great read, especially for horse racing season. Hill keeps adding twists and turns to the plot that definitely results in a “page turner” that you won’t want to put down. The reader is right there with “Fay” and Calaxto Coyune, her Cuban-American cohort and would-be lover, as she moves from one dangerous situation to another, trying to solve the mystery of who’s possibly involved in fixing races, as a young jockey is pressured to lose races. The horses are quite interesting characters, too. There’s Wiggly Wabbit, a gray filly; Ziggy Stardust, whom one has to threaten with a rake to enter his stall or have “his teeth embedded in [one’s] arm.” There’s Glow West, a chestnut, and best of all – Bionic, the fastest horse in the barn. And then there’s the encounter with her mother – after a 17-year absence – that, at first, seems unrelated, until Fia finds out her mother is deeply involved with the originator of the hedge fund. The one thing I worry about when there are unsavory characters using horses to make lots of money for themselves is the welfare of the horses. When the vet arrives and starts setting out vials of medicine, I wondered what drugs would be administered. They turn out to be “vitamins, permitted painkillers, and the diuretic Lasix, which was still legal in New York,” Hill writes. Still, there are questions about drug use, like corticosteroids and anabolic steroids, “since Pizutti’s horses had tested positive on race days before.” Fortunately, the grooms in this novel are all devoted to giving good care for the horses in their charge. As “Fay” uncovers one mob connection after another, and is nearly drowned by a mobster in Lake Desolation, the tangled web of “dark money” leads her to people far more dangerous than Pizutti. Her final encounter with the most dangerous mobsters ends in a most unexpected way – with the abused wife of one mobster getting her freedom, and the others learning a hard lesson at a shootout in an Italian restaurant, with the FBI SWAT team “cleaning up the mess.” To say the least – it’s a thriller! About the author: Sasscer Hill has been in horse racing as an amateur steeplechase jockey and racehorse breeder for much of her life. She sets her novels against a background of horse racing that involves big money and gambling. Her mystery and suspense thrillers have received multiple award nominations. She resides in Aiken, South Carolina.